Now the meaning of Kenshusei ( to research ) begins to show within the kenshusei as they take their training up a notch to aim for their Shodan. Here is another blog from a member of the Part-Time Kenshusei, this time it’s a fellow Englishman Steven Knowles. Now for some news from the weekend kenshusei course….. we have now completed dai ichi kihon. We finished with suwari waza kokyu ho 1 and 2, in the words of Payet sensei ‘the essence of Aikido’, as kokyu techniques do not rely on any joint locks or atemi but ‘simply’ (and I use that term extremely lightly as it is far from simple), precise timing and use of your opponent/partners power to throw them. Also, we did get some great encouragement in the last class of dai ichi in with of a test of our kamae, where our partners pushed and suddenly released the pressure. I think we were all pretty solid and Payet sensei was impressed (but not as impressed as I was). Now, all we have to do is build on this in the dai ni techniques and get it all flowing nicely as jiyu waza starts, too! Member of the Mugenjuku Part-time Kenshusei course. It’s only been 4 years since I have been fascinated with great martial art Aikido. More I　learned, more I got into this great phyilosophy　and techniques, which I believe is the key to save the world of 21 th century. Aikido is simply defined as a martial art but as I am a Japanese, I would like to share more wide thought about menaning of Aikido. Japanese Kanji contains too many meanings in its word. Ai Ki Do generally translated into to ‘ to go with Qi’, to go with oppenent or circumstances power. so you can also translated into Aikido as ‘the way to Love’. or sometimes unwillingly it lets me down, lets me too desperate to live. Still, I belive love is one of the ultinate purpose of living. AIKIDO gives you a kind of solution to love. Love requires timing, understanding and a certain distance to your partner. Which timing, where your opponent would like to go and how far you can beside. Through AIKIDO pracitice, you would learn these points. What a fortunate! Be a Aikido master, you would be a love master! It’s funny how our paths can change even when we are sure we are on the right one, or how easy it is to be distracted, but most of all it is so easy to forget what we have done…and because of this we still have a feeling of displacement with where we are today. I have been making some pretty big decisions recently regarding my direction in life and ideas I want to follow, and have been finally trying to listen to my self and understand what it truly is that I want in life. Now I am not saying I know a 100% but I have at least some goals set in place to help me on my way. The funny thing is by setting these goal I have started to slowly reflect on what I have done over this past year and 3 months, from a conversation at a certain window (strange I know – it makes sense in my head) to training in different dojos, to trips with friends to different places in Japan. The trial and errors I have gone through since my time In Japan and the learning curve for life has been amazing, I am not saying I know everything, in fact this trip has defently proved to me otherwise…it has shown me that there is so much to learn, so many ways to become better and things to strive for, see and do, but must most of all…it can all be done! It doesn’t matter what your goal is…if you want it, all it takes is you to make the decision to act apon it and then make the changes to get there, it sounds simple, and well actually it is…it’s a choice. Many people will sit and wish they were somewhere else doing something different, but will huff and shrug their shoulders and carry on with their day…I know this because I have done this and still do at times if I am to be honest. This is not something to be ashamed of mind you…..but what if instead of shrugging your shoulders you wrote your idea down and then looked at what you would need to do to do it, how do you get there and what it is thats stopping you right now from getting there. Once you have this you have the basic information you need to start making positive changes to what you are doing. Thanks to some very good friends I have been able to do this, my advice though, is when you do start doing things, don’t forget to look back on what you have done and remember all the achievements, hard situations and emotional moments that you have succeeded already! That past is was has built you, the future is what will create you!!! It’s is 23:56 of Sunday evening just 4 mins until the day of the kenshusei’s first test. 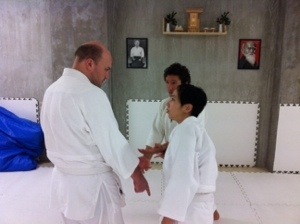 They will be going for a grade between 6th and 4th kyu. They have been training hard since April and this is their first opportunity to show what they have learnt so far. Good luck to all 3 of you, strong spirit and focused mind! Me, Chris and Izzy all wearing matching mugenjuku blue t-shirts and Takenaga wearing……well she’s special! We were waiting at the car rental shop for Payet Sensei and Chris Sensei to join us to pick the cars that we would use to drive to Wakayama the final resting place of O’Sensei! We spot two very nice family cars “their ours!! !” I said, well one was – Kenshusei and me, we get a cute little bubble car (street cred minous 80 points) the worst bit was when our DRIVER wanted to put her bag in the boot (trunk) and popped the bonnet to the engine open! I said my preyers and we left! Joe (visiting from NY City), his family, Nakaema San and Okitani San from the part time Kenshusei also joined us – not in the bubble car! 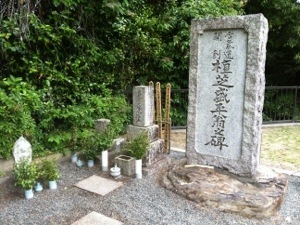 After a very noisy and long drive we finally arrived at O’Sensei’s grave. We looked around the shrine and the gardens before heading into the grave yard it’s self. It was a very peaceful and beautiful place with a view of the sea. Takenaga braught some insence, so we all said a prayer and put it at O’Sensei grave. We then scrubbed it clean and swept away any leaves and litter. After paying our respects we got back in the cars and Payet Sensei led us to the place O’Sensei would go when he was younger to study the mantras and meditate. It is said that this was a key factor in his unearthly strength. I didn’t find any extra strength but I did find a fruit on a tree which we could eat, a little like a peach, it was delicious! …next stop and just around the corner was the site where his original family home stood, now just a rectangle of grass with some trees, it was still strange to think what it would have been like for this young Japanese lad with a remarkable future ahead of him. Viking – that is what they call an all you can eat buffet, that always makes me giggle…I wasn’t giggling at the end when – yes once again I ate to much! Final stop – ONSEN!!! In fact the oldest in Japan, it was liturally two huge rock pools with very and I mean very hot water in them. You sit boiling like potatoes whilst watching the waves crash up against the rock – peace! Defently a story to tell, especially the giant woodlaos that crueled along the rocks, they were the size of my inappropriately sized……….thumb! Ow wait Final – Final stop – a fish super market (with its own mini aquarium) for some beers to drink on the way home! Arrived home just in time to get the cars in in time…quick drink by the river and off to bed. Good day had by all! So, you have all now been introduced and heard from the new Kenshusei. They have now finished what I would say is the toughest week of the course, because you go from being a civilian to a Kenshusei, it’s both painful, mentally draining and soul destroying…but if you can get through that you can get through the course! The course this year is slightly different for me, but in some ways even harder. I have responsibility of the Kenshusei, if they mess up it’s on me! I am pleased to have this responsibility though because I am extremely proud to be Kenshusei and of anyone who earns this title. I hope that those who do it, feel the same! They now have a weekend off, some have work but, all will rest and will be probably the most exhausted they have ever been. My advice to them would be enjoy every second of rest as much as possible, but most of all use your time wisely. Think of what you are about to do and prepare mentally – what will you eat and when, when will you cook it, when will you sleep, when will you wash your dogi’s and clean the house! Time is precious and if not looked after slips away!!! Can I introduce Yamamoto San. I had the honer to train with this man tonight, and train I did. He threw me to the ground with such power that he made all 84kg of me bounce of the floor… Not just once but repeatedly! The best bit! He took it from me to, taking my ukemi and I didn’t hold back! 75 years old…just goes to show it’s not age that counts, it’s what you do with those years of experience! I have such admiration for this very humble man! Well it was all over in a flash, a course which at the begin flew, even though the days seemed long and hard, memories of a year, feel my eyes with tears of the many happy memories that I have. Spent in the dojo, work and outside with friends. The hard ship and pain that we went through, the funny story’s and achievements that we can reflect on. It seems like only yesterday that I was at the airport saying good bye to my parents. The course finished on the 28th February with Yasuda and Yannick taking their instructors test. They passed and did a good job. We all did the written exam, which for me was the first exam that I actually really enjoyed. Writing about aikido for one hour, brilliant! We had a good farewell bash to send Yannick off, a good one in which he didn’t get any sleep all night before his flight home…well it was an early flight, what’s the point of sleeping when there’s drinking to be done!!! So the course has been over now for a while, and I have gradually been getting back in to training because of my knee. It’s been strange not training so much but my days still are just as busy! I will be in for an even harder year this year being sewanin (assistant or manager) of the Kenshusei along with Yasuda. I will be doing every day plus the part time Kenshusei at the weekend. Epic!!! (Next day off – maybe August) . I don’t know what this year has to offer but I hope I can give the new Kenshusei an experience that makes them feel as happy as I have been, if not better. Finally today…23rd March 2013, Andy Sensei took his 3rd Dan test, the result is un known but I would like to congratulate him for doing an outstanding test. For me it was his sharpness in his form! It is a reflection of his behaviour when he is in the dojo. I have the upmost respect for this man because he honestly gives 200% to the dojo and is switched on all the time! A note for the new Kenshusei, if you want to know how to behave in the dojo, like a Kenshusei should – study his every move! It’s funny how a room can look different when it’s empty…it seems strange to walk in to it, but randomly quite exciting at the same time because you know there is something new about to begin. We had packed up Shijo dojo on Wednesday, everything into boxes, taped up and ready. Then today final soji (clean) and await Payet Sensei’s arrival with the van to transport everything. Payet Sensei arrived and we loaded as much as we could in to what I have named ‘the white tardis!’ It was a small little white van but it was amazing how much you could squeeze into it. After cramming everything into the tardis Andy Sensei joined Payet Sensei and they drove to the new dojo. I followed on my bike…push bike that is. I had to cycle hard and fast to keep up, weaving my way around people. Then I lost them, I had to come away from the road side and I lost sight of them. I raced through the car park of Nijo castle, till I finally caught a glimpse of them, Then I realised that I was blocked in, fencing along the path and the car barriers were down. I went to swing the back tire around and slide under the barrier like In a James Bond movie, when suddenly out of no where a voice began to shout at me in Japanese. Arhhh I thought so I grabbed my bike chucked it over the fence jumped back on and carried on after the van. 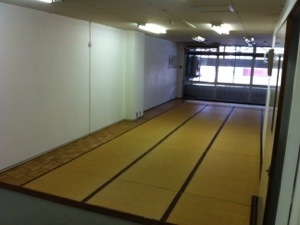 We eventually got to the dojo…at which point Andy Sensei had to get back to shijo for kids class. This meant my entire near death experience of a bike ride was well…pointless. 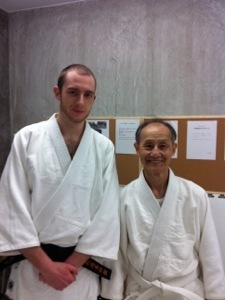 Me and Payet Sensei then spent the rest of the time until 7:45 moving everything to the new dojo. Wow how much stuff can come out of one place, it is amazing!!! We finally got the last of the move done and everything crammed into the dojo… But tired after a long day we went for a beer, some food and then bed. Amazing day, but as soon as my head hit the pillow it was lights out. 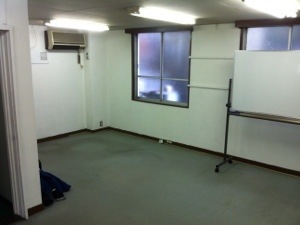 Sad to say good bye to the two dojo’s I have spent the last year, my first year in Japan, in.